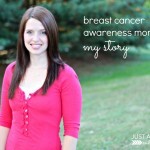 Hello, Just a Girl and Her Blog Readers! 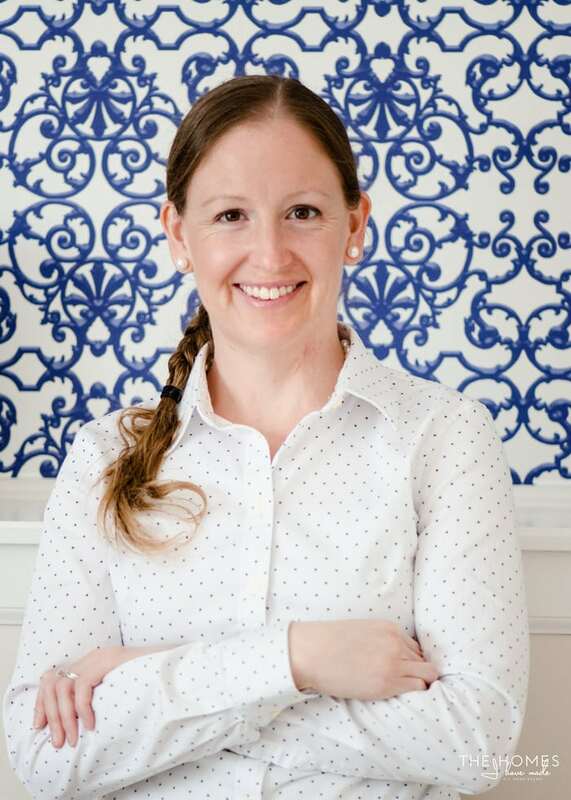 My name is Megan from The Homes I Have Made, a DIY/home blog where I share budget-friendly and totally temporary home décor and organizing solutions as we move from home to home as a military family. 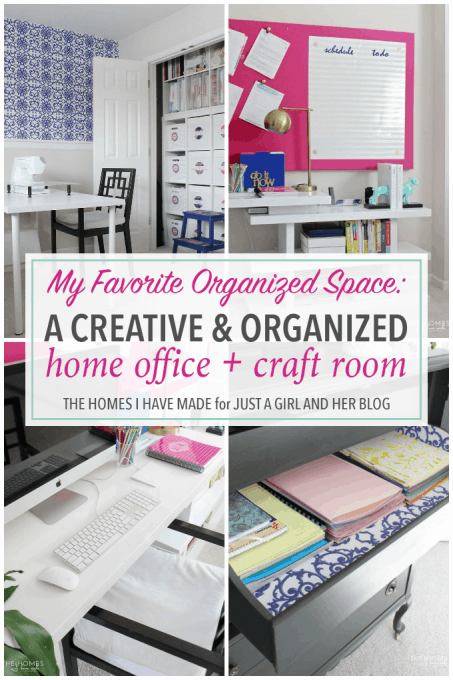 I am so excited to be here today sharing one of my favorite organized spaces: my home office/craft room from our last house in Leavenworth, Kansas. Like Abby and Donnie, my family and I are also transitioning to a new home this summer, so unfortunately this room has already been taken down and boxed up. 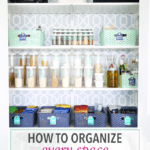 Even so, it’s still one of my all-time favorite organized spaces, and I can’t wait to give you a quick tour today! 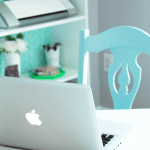 As a passionate crafter and DIY blogger, my husband and I learned a few years ago that everyone’s lives were made a bit easier if we created a dedicated craft and workspace within our home. As such, we’ve sacrificed a guest room in our last two homes in order to have an office/craft room that allows me spread out, create, and store everything that comes with this business! 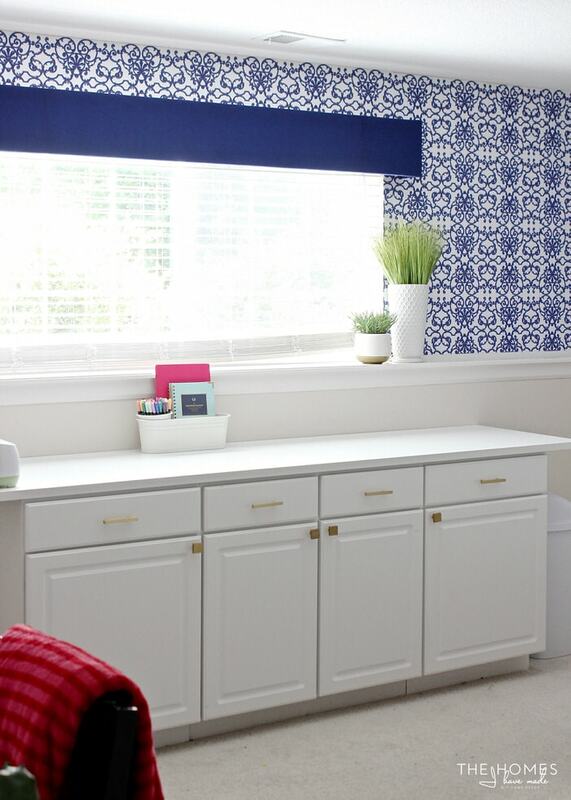 Between the counter station, the sewing table, and my computer desk, I easily spend a majority of my days crafting, designing printables, editing photos and writing posts in this room! 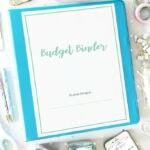 But beyond providing me with the space I need for the multitude of projects I constantly have going, having a dedicated craft room also created a central location in our home for all things project related. Whether it’s finger painting with my son or helping my husband put buttons back on his uniforms, the whole family knows their way around this space and comes and goes throughout the day to visit, play, craft and work. The sewing machine is often cleared off to make room for LEGO building or Play-Doh sculpting; and my son will often come stand at the counter with me to watch my e-cutter go or to help me paint my latest project! 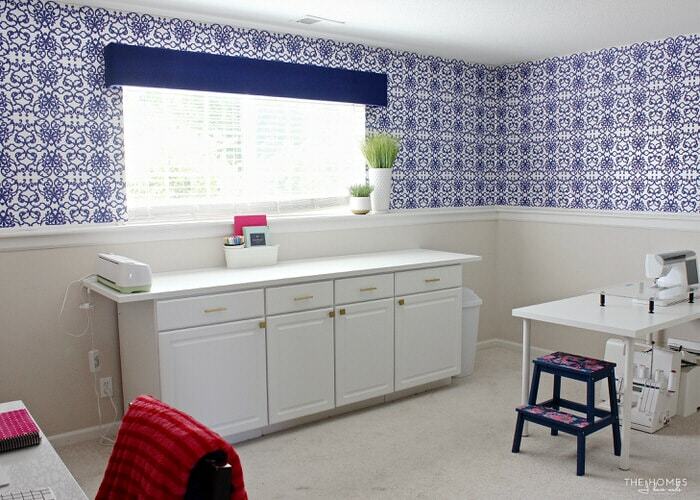 This room is technically my home office, but is very much a space for the whole family to be creative! If there is one thing about crafting and being a DIY blogger, it tends to require a lot of stuff! From supplies and notions to props and tools, creating the projects and shots you see on your favorite DIY blogs takes a lot of stuff! I’m an organized girl at heart and can’t really function when my stuff is in disarray, so having and keeping this room organized to a “T” is a top priority. As such, I try to implement organization systems that not only perfectly contain what I’m trying to store, but are also user-friendly enough that getting items in and out is a cinch! 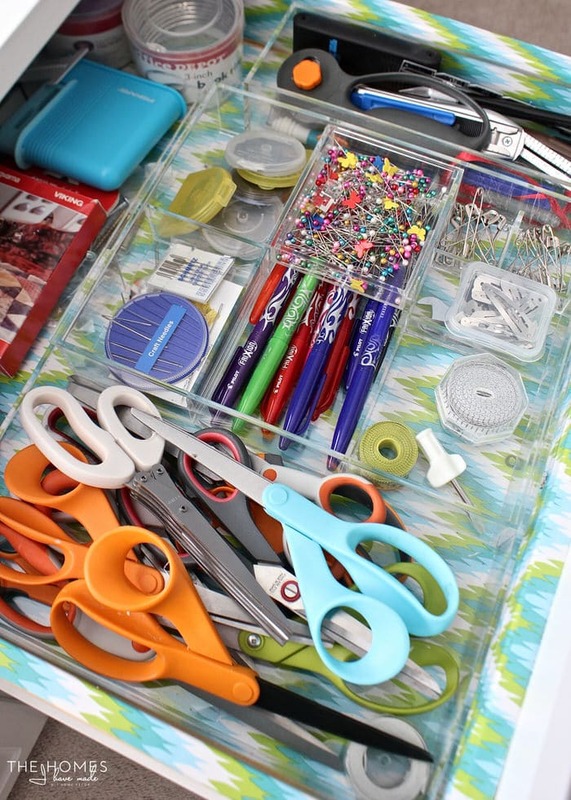 At my craft counter, I load up the top four drawers with clear acrylic organizers to hold all the little items I use most often. 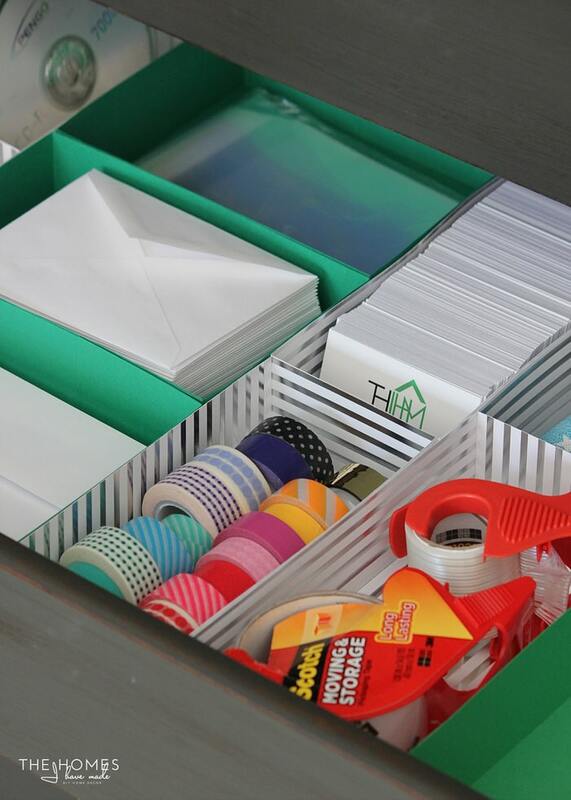 Scissors, glues, pins, tape measures, and more are just a few of the items given this premier spot! In the large cabinets under the counter, I load up all my small craft supplies into plastic containers with flip-top lids. 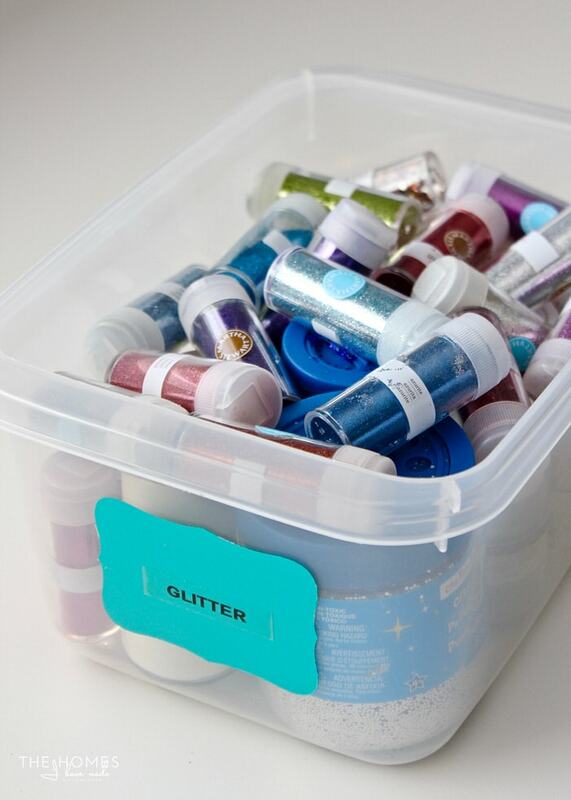 Stacks and stacks of containers hold glitter, small bottles of paint, sewing notions, beads, glues and everything else you can think of! I have a small obsession with fabric. To keep my collection under control, I limit myself to what can be stored in a very defined storage space. 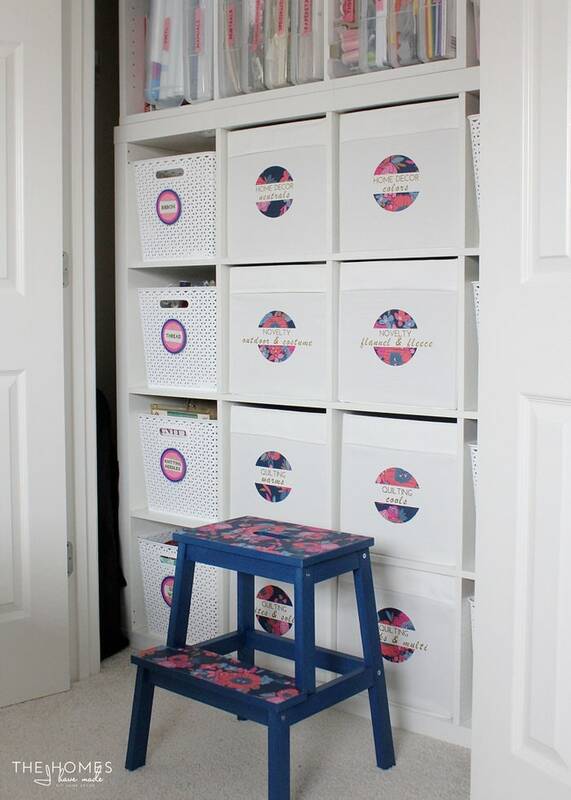 We moved an IKEA Kallax system into the craft room closet and gave me 8 large totes to fill as full as I wanted. 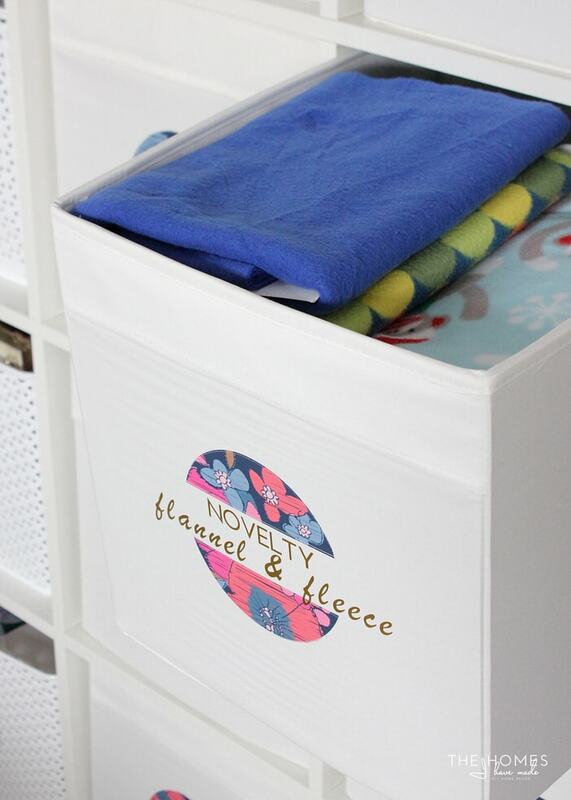 In order to keep the fabric tidy and organized, I wrap most of it onto mini “bolts.” This system allows me to pull out the bins like drawers, see what I have, take out what I need and leave the rest in place! If and when the fabric starts overflowing, it’s time to purge! 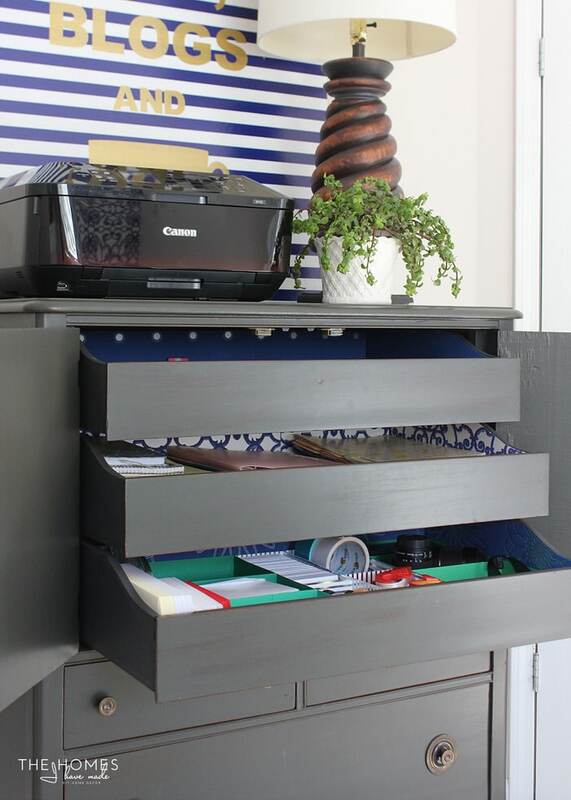 Our current desk doesn’t have any drawers or cubbies, making it quite difficult to store office supplies. To remedy the storage conundrum, we outfitted an armoire with a bunch of paper dividers and filled the entire unit with every last office supply we own. 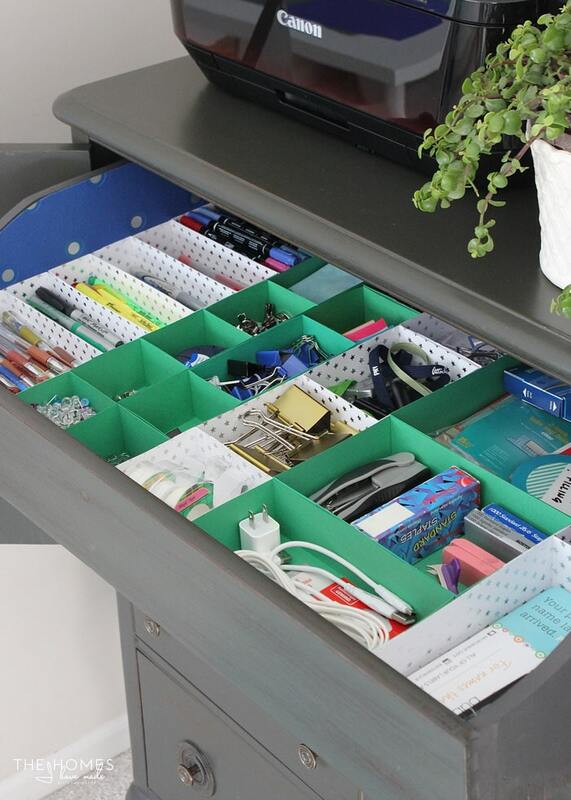 From small things like paper clips and thumbtacks to larger things like our laminator and scanner, every single office supply we own is stored in this one tidy spot! Last but not least, when I am not in project mode, I like to have my surfaces clear. All of the totes and bins and organizers help me quickly and easily put craft supplies away; but to deal with the paper stacks that seem to accumulate, I made a huge pin board to hang over my desk. 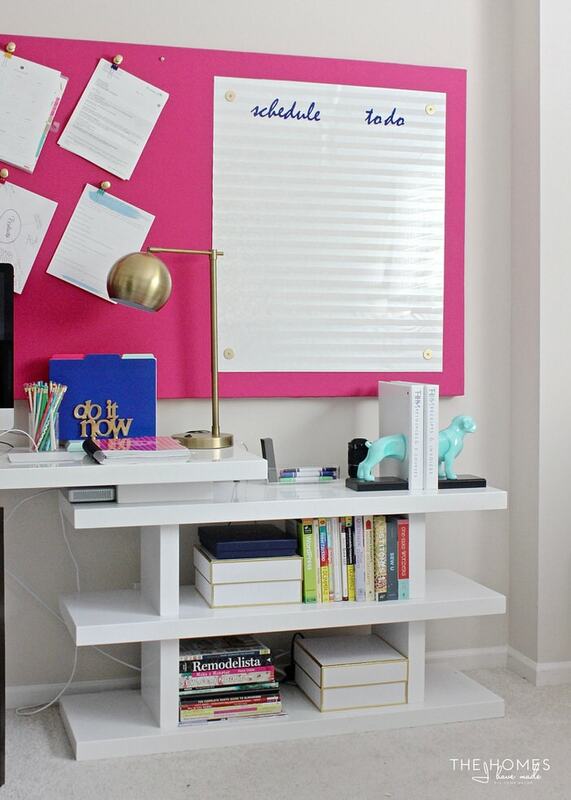 Not only did it provide a major dose of color for this side of the room, but it gave me a centralized location to pin up random papers and scribble down notes, ideas and reminders! I find that if my organization systems are pretty and fun to look at, I am much more motivated to stick with them. 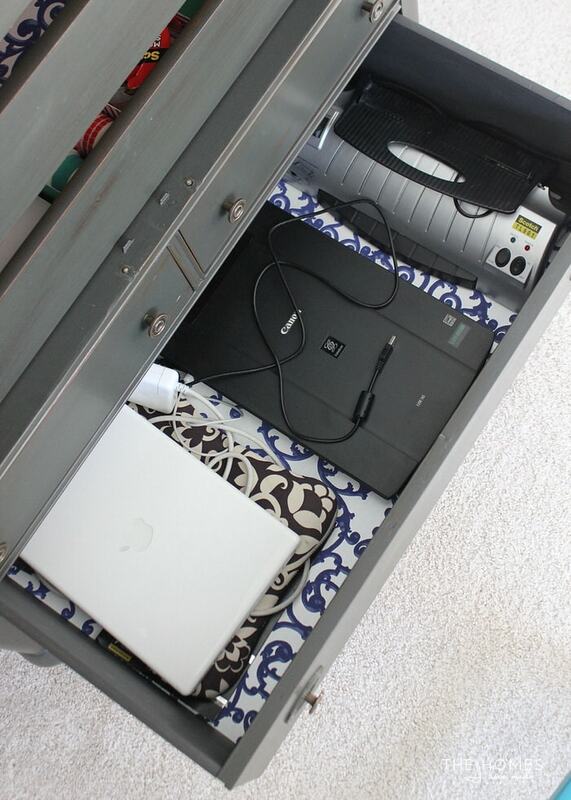 As such, I consider the way things look as well as how they function when I am organizing a space. 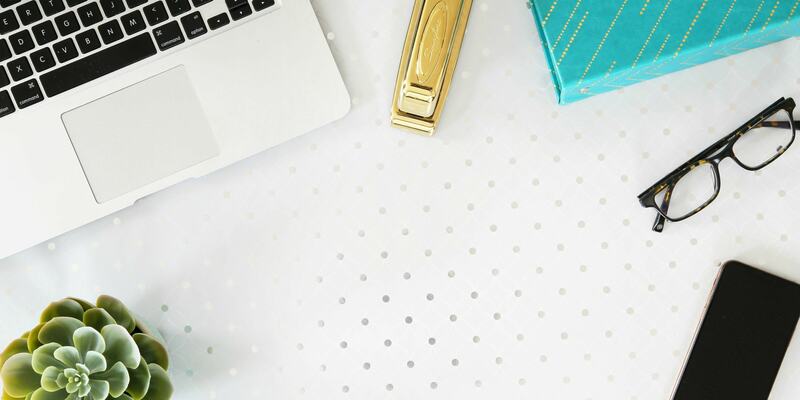 I don’t want to deal with a lot of extra fuss in a space that already gets pretty messy, so I mainly relied on clean white surfaces combined with pretty papers and other small details to make this space look as good as it works. 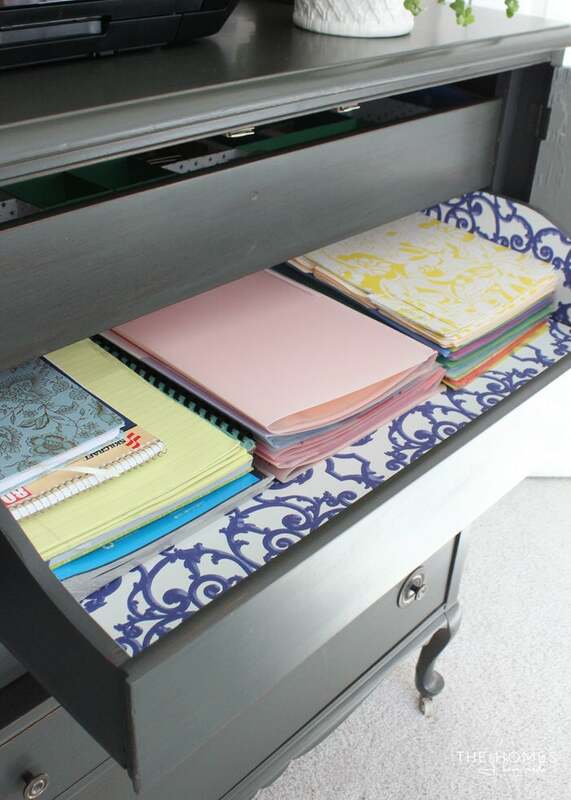 In the office armoire, I lined all the drawers with scraps of wallpaper before filling them up with dividers made with pretty and coordinated scrapbook papers. Vinyl letters and peel-and-stick wallpaper circles work together to make pretty and descriptive labels for the fabric bins. 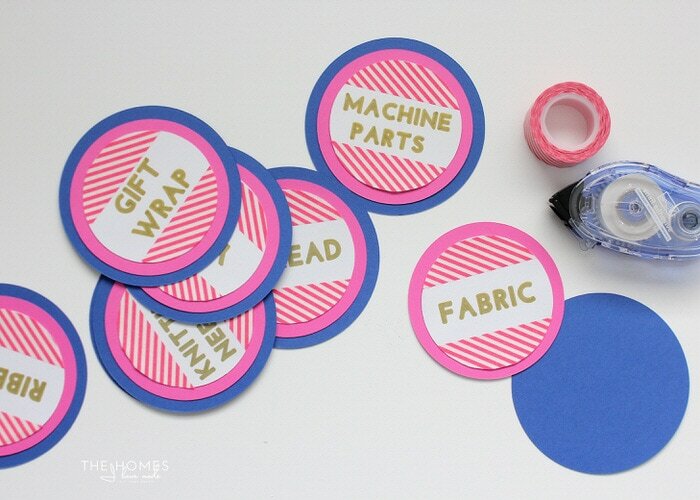 And more eye-catching labels were made by combining washi tape with cardstock circles! Perhaps the most interesting thing about this space is the wallpaper! We are renters after all…and beyond that…we only lived in this house for a single year. I didn’t want to paint the walls for just a year, but the bland beige walls with all of our white furniture was leaving me so uninspired. 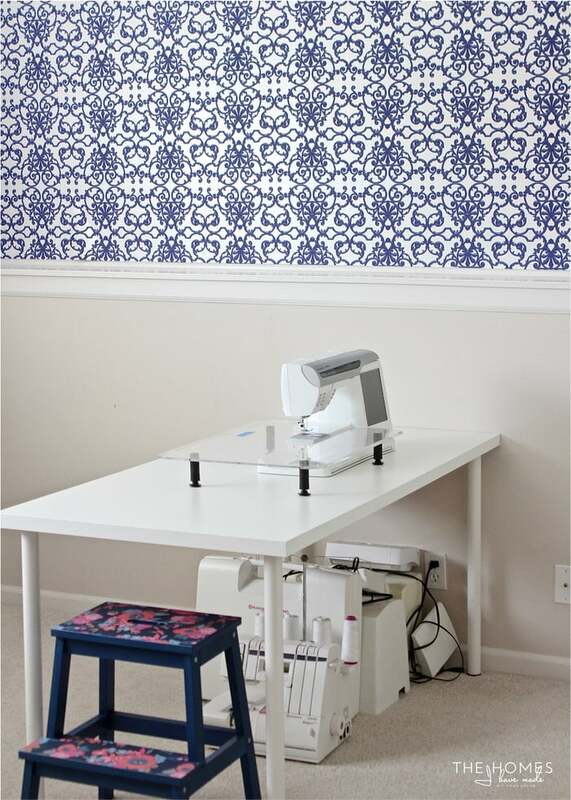 I devised a way to hang wallpaper in a totally renter-friendly way using the old liquid starch trick (get the tutorial here), and it was a total success. 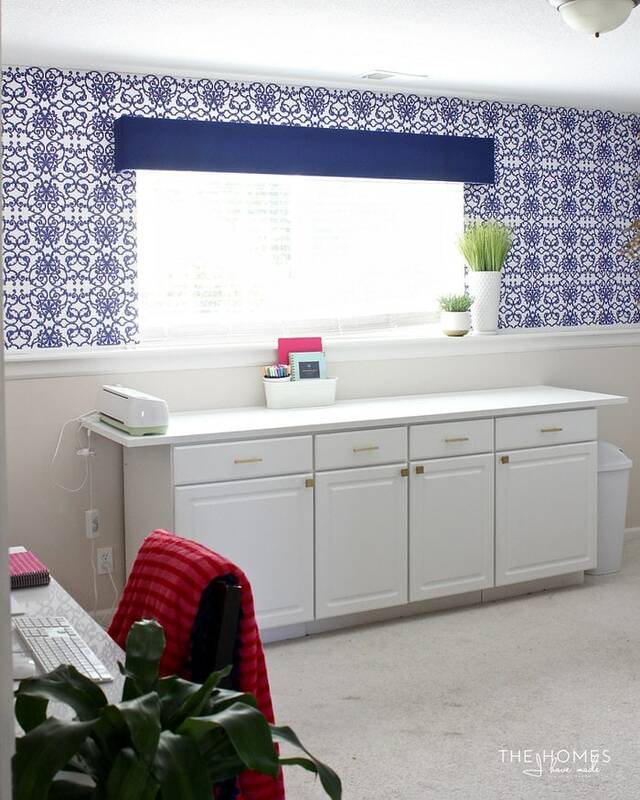 I am a sucker for bright and bold patterns, and this paper was a total game changer in this space. And the best part of the entire project? It all came down in 5 minutes, leaving my walls pristine. Don’t believe me? See the wallpaper removal in action here! Because we move so much, I get the opportunity to refine what works and doesn’t work with each new home. In the past, I struggled to find the right combination of craft, sewing, computer surfaces…always feeling like I was shifting things out of the way to create the next craft, write the next post, or shoot the next project. 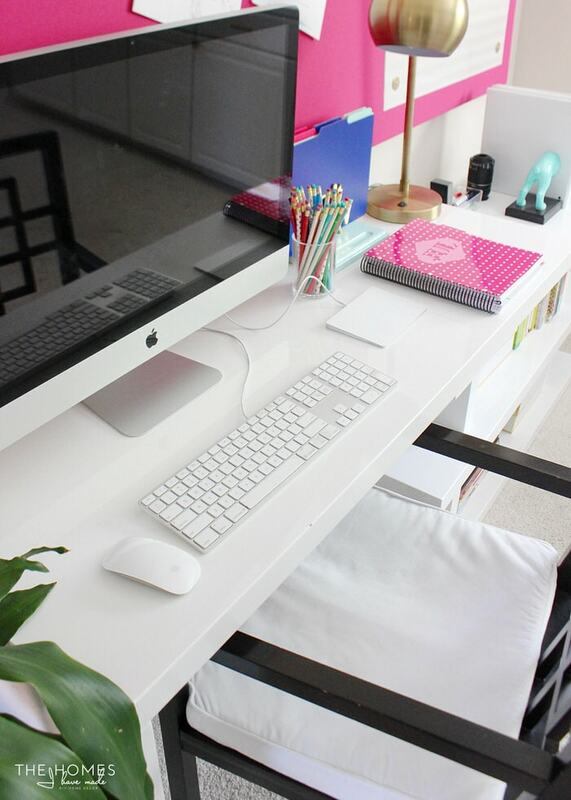 I sure did love the bright and clean aesthetics of this space, but it was having three dedicated work zones (craft counter, sewing table, computer desk) that made it one of my favorite and most functional spaces ever! I hope you all enjoyed this look into my craft and work room! As I said, my family and I are now in the process of moving into a new home, and you can follow along in our adventures and she how this room continues to evolve over on my blog, The Homes I Have Made…and be sure to keep up to date via Facebook, Instagram, Pinterest, Google+ and Twitter! 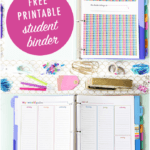 And if you like printables (which I know you do because you are an Abby superfan like me! 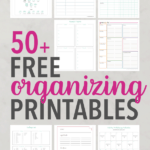 ), be sure to check out my library of over 100+ pages of organizing printables here! 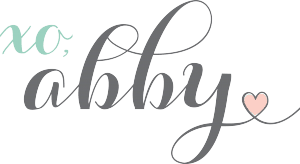 Last but not least, I’d like to say a huge “thank you” to Abby for having me here today! 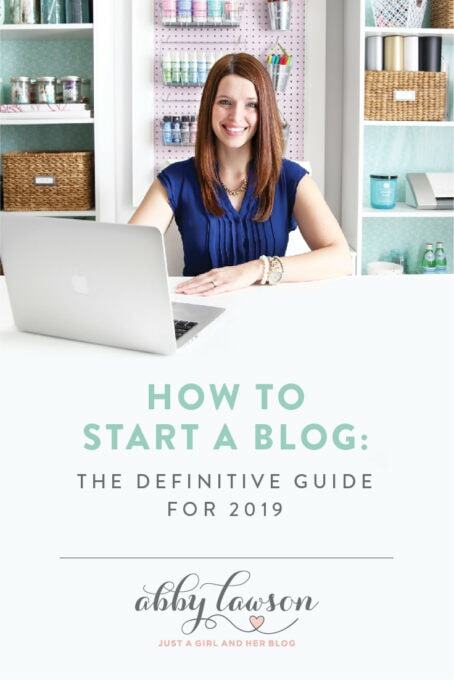 Not only am I a huge fan girl of Abby and her clean, simple, and oh-so-smart organizing solutions and printable collections, but the tips, tricks, and ideas she and Donnie have done and shared through the Building a Framework e-book and community have directly impacted the blogger I am today! 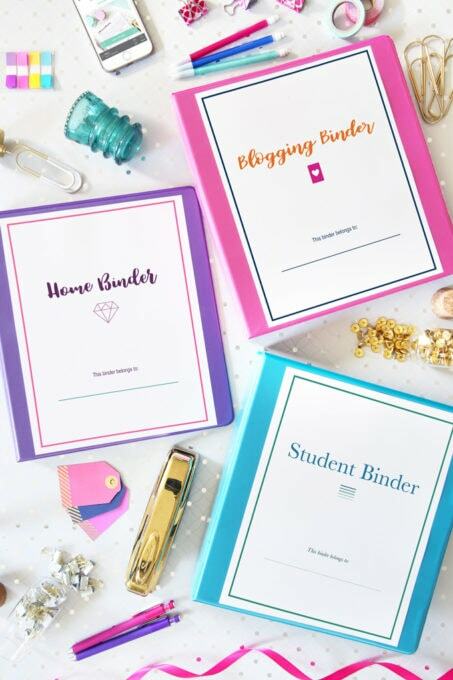 They will forever be a part of my blogging journey, and I am beyond thankful and humbled to be sharing some of my ideas here today! Can you believe that wallpaper was temporary?! And I had to pick my jaw up off the floor when I saw those gorgeous drawer labels– major label envy over here! 😉 Thank you, Megan, for sharing your gorgeous space with us, and best of luck with the transition to your new home. 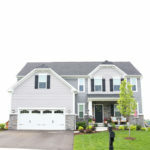 I know you will make it an incredible place for your family! 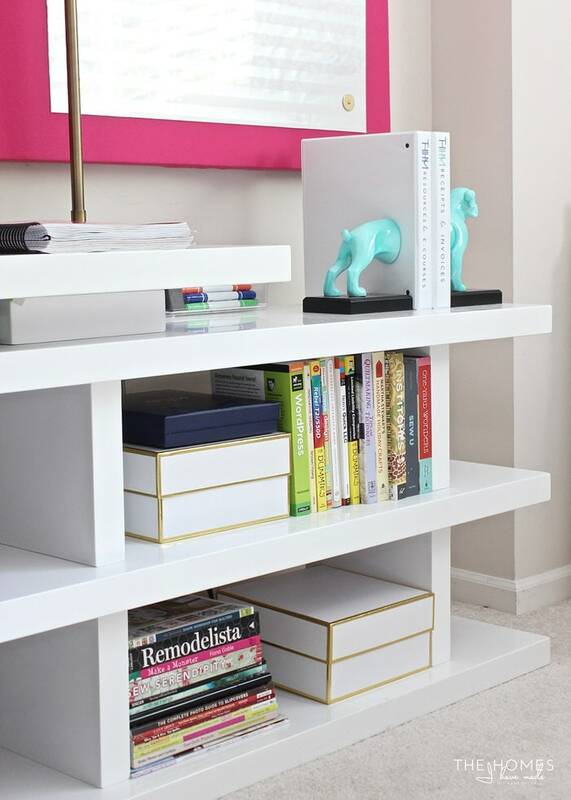 You have a simple yet meticulous elegance in organizing your space. I already have couple of ideas from you, thanks! Aw, you are too sweet, Jennifer! Thank you so much! Have a wonderful weekend! 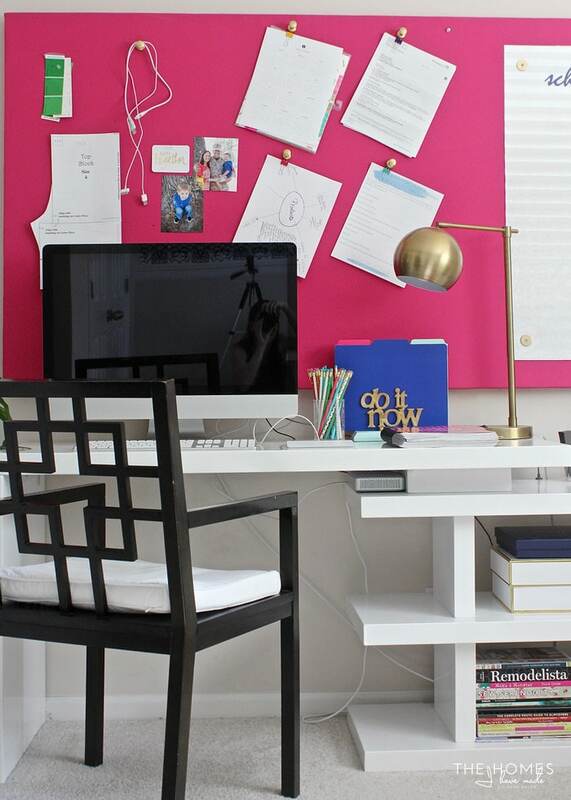 Love that pin board, I want one! Looks like I have another DIY to do! My husband is going to kill me, when I tell him I want to rearrange my room again (seems like every 3 months I am adding and moving around something). I’m trying to find my zen. I’m almost certain you’re a kind reader Abby. I rearranged my entire office/studio last week (phase 1) and so this week it’s time to organize! This post is perfect timing! I like Megan’s labels and how everything has a home. Very nice! !